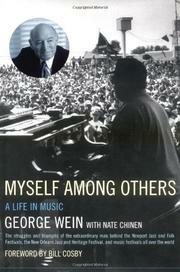 Garrulous memoir by the music promoter and club owner who brought jazz to the masses through the Newport Jazz Festival. “I was fortunate enough to have an older brother who set a precedent for underachieving,” writes Wein. We were all fortunate. His brother liked the jazz clubs on 52nd Street more than the classroom, and he brought young George along, nurturing in the boy a love of Art Tatum, Hot Lips Page, Thelma Carpenter, and Frankie Newton. In 1950, Wein opened a club in Boston called Storyville and launched a half-century of jazz promotion. In plain, if at times serpentine, prose (“I think that even after these short moments I thought that perhaps our lives would become permanently intertwined”), Wein tells of ushering practically every jazz musician alive through Storyville’s doors and bestows a little story upon each: Billie Holiday, Ella Fitzgerald (“I developed a blister on my middle finger from snapping to the beat”), Charlie Parker, Lester Young, George Shearing. From these associations he was able to patch together the Newport Jazz Festival, a terrific fusion of art and pop, elusive and foot-tapping that was forever in one form or another of trouble: financial, legal, critical. Wein promoted ferment as much as music; he introduced rock into the jazz festival in 1969 (“Led Zeppelin’s performance was a wall of pure energy”) and electricity into the Newport Folk Festival—another of his brainstorms—in 1965, with Paul Butterfield and Bob Dylan. He managed to infuriate both jazz purists (Nat Hentoff thought Newport was crassly commercial) and folkie diehards: when Dylan launched into “Maggie’s Farm,” Wein writes, “the prevailing feeling among the crowd was a sense that they had been betrayed.” It was also history, and he invites readers to walk along at his side as he made it. Wein is eye-crossingly voluble, but he does have a lot of stories, perspectives, and music history to get off his chest.